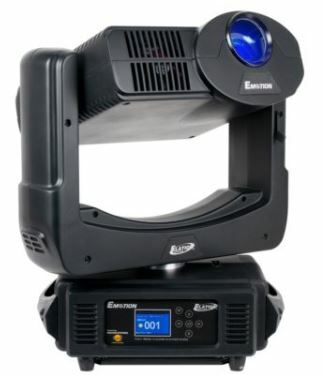 The EMOTION™ is a compact high output lightweight plug and play digital projector moving head lighting fixture featuring the OSRAM 240W UHP >80CRI 6,700K lamp producing 4,000 ANSI lumens and native 1024 x 768 support. Key features include an internal 64GB solid-state hard drive media server with royalty free digital gobo and video images, live background effects and allows custom content to be easily uploaded remotely via the PC based CMA application. Included Collage Generator™ allows for seamless projection arrays (2-16 fixtures) and variable edge blending. CMY and RGB color mixing, digital and optical zoom, motorized focus, mechanical shutter, dimmer, 540° pan, and 240° tilt control via DMX / Art-NET, (2) USB 3.0 ports, RJ45 inputs for graphics server and Art-NET, 5pin DMX and powerCON in/out, and a multi-voltage universal auto switching power supply (100-240v).